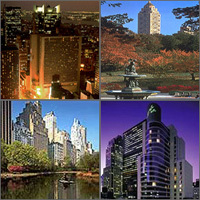 Compare discounts for Hotels in New York, New York! New York City is probably the world's most vibrant and sprawling metropolis. It is divided into five boroughs: Manhattan, Brooklyn, Queens, the Bronx and Staten Island, however for most of those visiting the city, New York means Manhattan and Manhattan means New York. From Wall Street to Greenwich Village, from the Soho to Fifth Avenue from Times Square and Broadway to the Upper West Side, Manhattan is the world's center for almost everything. Art, Finance, Academics, Diplomacy, Architecture, Entertainment - New York has it all and of the finest. The average tourist week stay will never be enough, the good thing is, that with New York airports serving as a gate to so many places - you can always come back for more! Magnificently restored to the spirited beauty of its art deco heyday, The New York Jumeirah Essex House on Central Park, is a sublime oasis of elegance and style in the heart of midtown Manhattan, just minutes from Carnegie Hall, Fifth Avenue shopping and the Museum of Modern Art. The newly renovated, San Carlos hotel is an elegant, charming and stylishly sophisticated hotel located on the fashionable East Side, four blocks east of Rockefeller Center. Experience French hospitality between the exclusive 5th Avenue shops and the hustle and bustle of the theater district. The Soho Grand Hotel is located in the heart of SoHo, in close proximity to numerous art galleries, boutiques and restaurants as well as to Tribeca, Greenwich Village, Chinatown, Wall Street and New York University. Feel the pressures of the outside world melt away at this New York palace nestled in the center of Midtown Manhattan. Le Parker Meridien is a luxury hotel located in Midtown Manhattan two blocks south of Central Park, between Sixth and Seventh Avenue. Nothing less than a New York landmark awaits you at this world-renowned Park Avenue hotel whose very name conjures up elegance. The Tribeca Grand Hotel opened in mid 2000 is located in the heart of Manhattan's Tribeca area, within walking distance of an exciting mix of restaurants, shops, financial institutions and thriving independent film companies. Nearby are Wall Street and the excitement of SoHo and Greenwich Village. Sleep soundly while towering over all the excitement of Manhattan at this premier hotel connected to Grand Central Station. Come join The Omni Berkshire Place in a graceful and traditional style that provides the ultimate hotel experience. The Kitano New York is an elegant Neo-Classical, 18-story hotel located in the Murray Hill neighborhood, 4 blocks from Grand Central Terminal.